Authorities are attempting to counter the Boko Haram insurgency by offering an allowance to parents who send their children to school. It comes amid reports some familes are 'donating' their daughters to the insurgency. Parents in Borno State in North East Nigeria may soon receive government allowances for sending their children to school, as the region continues to suffer under the influence of the Boko Haram insurgency. State Commissioner of Education, Musa Inuwa Kubo, told a news conference in the state's capital, Maiduguri, that the government had already prepared a new program called Conditional Cash Transfer to Parents. It is hoped that this initiative will encourage parents in the region to send their children to school and fight against extremist ideology, while also helping to revive a struggling education system following the 8 year insurgency. Over 800 schools in northeastern Nigeria have been damaged, burnt, looted or remain occupied by internally displaced persons (IDPs) who sought refugee inside the classrooms. Most school children in Borno State have lost at least an entire year's worth of education in the midst of conflict, displacement, family separation and death. Boko Haram also explicitly forbids what they consider to be Western-style education. Parents of girls will receive a higher allowance than boys in a deliberate attempt to improve female education. This new offer from the government follows recent reports that some parents have willingly sent their teenage girls to Boko Haram in order to carry out suicide bombings. 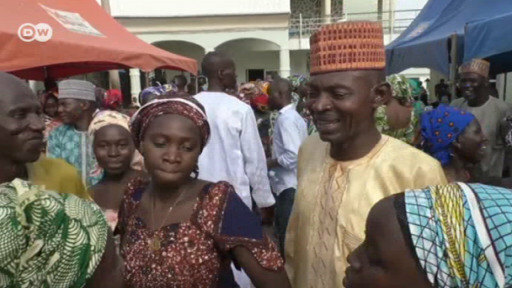 Nigerian army spokesman, Sani Usman, is now appealing to religious, traditional and community leaders to strongly discourage people to give away their daughters to the terrorist group. However the majority of families in the region have reacted angrily to the accusations, including father-of-four, Sani Yara from the Gonge area of Maiduguri. "The reality is that no sensible God-fearing father can give out his children – especially a girl – to be used as a weapon to kill innocent civilians, unless he is a member of the terror group," he told DW. "It is very unfortunate and we condemn such acts. We are law abiding citizens and we will report anybody who gives away his or her daughter for a suicide mission." Meanwhile, the military claims some minors are 'donated' to Boko Haram as a way of carrying out attacks against the government civilians. Security expert Shehu Umar says this has further complicated the war against terror in the region. "If a parent can send their children to serve as suicide bombers to cause mayhem in the name of ideology, I think the implication here is that we have a community that is supposed to assist the security agents, but that community is now becoming a suspect and is seen as being part of the problem rather than the solution," he told DW. Nigerian political analyst, Abdullahi Inuwa, says it is a constitutional provision that all members of society provide necessary information to the authorities and cooperate when required. "I urge the society to cooperate with the military, but the military should also start abandoning this militaristic attitude so that people will feel more confident and free to give them information. At the end of the day, this war will end."